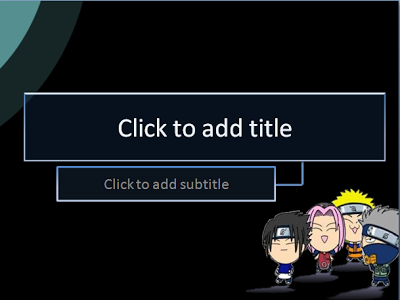 This is PowerPoint template that we created specifically for the edition “Naruto Special Template“. Although this template is using the anime-themed background, this template is made very simple in order to facilitate users when to apply them in a variety of presentation themes. With a background of Team 7, or better known in the anime series Naruto as Team Kakashi, powerpoint template is expected to be make the presentation more interest. Team Kakashi, also known as Team 7, is a team led by Kakashi Hatake and was formed after the members became genin. The members were selected in order to balance out their talents. Naruto, the worst student in his graduating class, would benefit from Sakura’s intelligence and Sasuke’s proficiency with ninja skills.